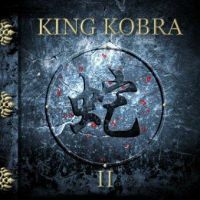 King Kobra’s reunion album is a collection of tunes that deserves recognition on a grand scale. Nursing choppy riffs and a strong aroma of rousing bluesiness carrying that familiar 80’s heavy metal edge, this is first class rock with oodles of dirt underneath its fingernails. And the best part is that King Kobra have all the symptoms of a vital and evolving beast, with a number of aces stuck up their sleeves. The albums strengths are built on a marriage of strong songs and crafty musicianship. Shortino’s gritty vocal delivery remains the focal point of blasters like “Hell On Wheels”, “Running Wild” and on the prowling “Don’t Keep Me Waiting”. Musically “II” is a smooth-running incubator of admirable ideas and unconcealed influences. “The Crunch” is confident in showcasing its classic Whitesnake era DNA and both David Michael-Philips and Mick Sweda are often found fervently challenging Michael Schenker. However, this is far from saying that they lack originality. The inspiration fully flows on “Knock Them Dead”, the boogie flavored and southern rock inspired “The Ballad Of Johnny Rod”, and also the booze-up craving “Have a Good Time” is a simpleminded, sweat-soaked pleasure. Yes, there is one slipup with “Got It Coming” falling flat on its face; still “Take Me Back” finds King Kobra standing reasonably strong in the ballad department. But just as you’re about to dismiss this lot as another bluesy hard rock knees up, King Kobra throw you a curve ball with “Deep River”, a high-spirited epic capable of going mano-a-mano with the likes of “Kashmir”. This is a stunning piece born of adversity, with a full on power gospel choir pushing towards an unpredictable soulful conclusion. A fitting testimony of the bands valiant return to form!